Nissan Frontier Forum > Nissan Frontier Forums > General Discussion > Interstate AGM battery? I am fed up with Optima. My first one was almost 8 yrs old when I sold the truck it was in, still working well and never failed to start the engine. The following ones, in two different vehicles including my ‘05 Frontier, had shorter lifespans. Got one more that lasted over 7 yrs, but everything else lasted only between 2 and 3.5 yrs. This latest one does not hold a charge, and I am looking at other AGM batteries. I live at least 4 to 5 hrs drive from the nearest larger city (if you consider Albuquerque large), so vendors are, shall we say, limited. Someone told me that Interstate has a new AGM battery. Interstate supposedly makes one that will fit the truck. Has anybody used this battery? The truck is hooked to Optima’s smart charger, D1200 model, and it keeps saying it is 100% at only 12.3 V. Even when I disconnected the battery from the truck and charged the battery for 68 hrs to allegedly 100%, the voltage dropped down to around 12.3V in only 5 hrs of sitting in the garage, still disconnected from the vehicle’s cables. interstate is assembled in the US but utilizes parts from everywhere else. I'm pretty sure a lot of their batteries are now made in Mexico - some of which are rebranded from other manufacturers. IMO, Odyssey is the best battery on the market - period. You’re correct! Made in Monterrey, Mexico. I need batteries. Yes I would go to Odyssey battieris but my mounts are for Optimas. If they would fit, that is what I would buy. 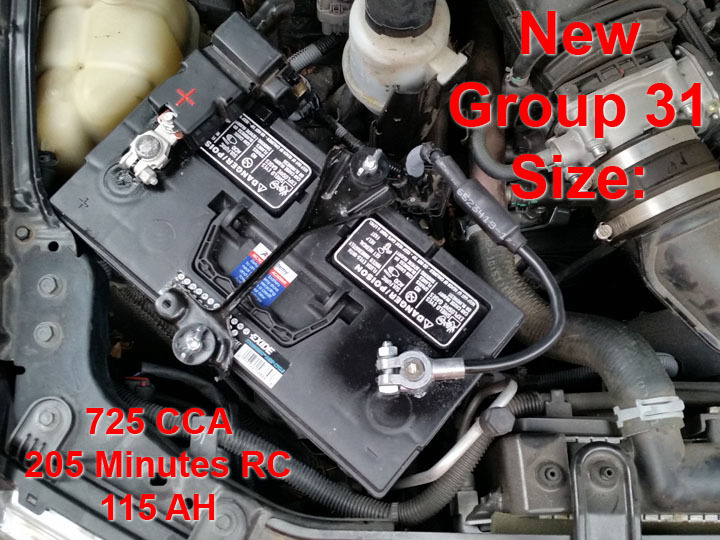 ^You can go considerably larger than Group 24F, particularly if you don't mind lengthening the battery cables. have a Group 31 in mine. Optima's spiral-plate design is lame - leaves a lot of wasted space between each cell. A conventional stacked-plate configuration is more space-efficient - squeezes the maximum amount of plate area into the space available. Last edited by Skibane; 04-14-2019 at 10:50 AM. ^You can go considerably larger than Group 27F, particularly if you don't mind lengthening the battery cables. I was hoping you'd chime in. I knew you run larger but couldn't remember what size you had. I have Odyssey’s in my Dodge. They were Optimas. Same with the Frontier. Optimas lasted 3 years and a few months. Thanks for the plugs for Odyssey, which are not available close to home. I was asking about Interstate because they are widely available, though I don’t know if the new AGM battery is here yet.